With such a large number of existing Solid State Drive (SSD) vendors it can be very confusing for the end user to decide which drive is the right drive. If you have done even a little research on SSD the first thing you notice is the overwhelming number of SSD manufacturers available, as well as the huge range of prices and specification variables. It can be quite confusing trying to understand which SSD drive will work best for your specific application. The first step is to understand your application requirements and focus on finding a product that will give you exactly what you need. There are many variations of SSD’s available on the market, some are designed to be Hard Drive upgrades, and other drives are configured to make sure they will never fail even in the toughest conditions. Military applications may call for a drive that can handle very high temperatures and vibration, while a user wanting to upgrade a computer may just want a simple performance boost thus a lower grade SSD may suffice. The DIGISTOR Professional Video Series SSD was designed with one very specific application in mind, Uncompressed HD Video acquisition and work flow utilizing the Blackmagic Designs Cinema Camera the Blackmagic Design HyperDeck Shuttle and the Blackmagic Design HyperDeck Studio. Our design is optimized to handle high definition uncompressed 10-bit and 12-bit RAW video capture. The DIGISTOR™ Professional Video Series SSD drives use the highest quality controller and NAND memory components which allow for high performance, but also multiple data deletions without performance degradation. An unfortunate quality of many Solid State storage devices is that the more data or in this case video files that are deleted from the drive, the performance can start to decline. The DIGISTOR™ Professional Video Series SSD drives were designed to fight against data deletion performance loss, which allows for users to get the most out of the SSD drive from both a performance and durability perspective. This will allow for a tremendous user experience both now and as the drives are used in the coming years, at a very reasonable price point. Another very key feature is drive formatting; most drives on the market today are unformatted leaving it up to the end user to deal with compatibility issues on their own. The DIGISTOR™ Professional Video Series SSD is formatted in the exFAT format which allows for maximum compatibility with Mac, PC and Blackmagic Design devices without the constant re-formatting. There are no proprietary drivers or software needed, the DIGISTOR Professional Video Series SSD drives are the most compatible drives on the market. The Professional Video Series SSD drives from DIGISTOR™ were designed and are certified for use with the Blackmagic Design platform of products and currently come in 240GB & 480GB configurations. Since its emergence into the market just a few short years ago, Blu-ray technology has evolved into one of the most stable, cost effective and remarkable technologies to take up space in the optical drive arena. What once was considered a high cost alternate to DVD drives and recordable DVD media, is now the most economical and advanced substitute (if not soon-to-be the replacement) for traditional DVD. With its cost reducing dramatically and its almost limitless archival capabilities, Blu-ray technology has become the technology of choice for Film, Television, Videography, and Photography professionals worldwide. 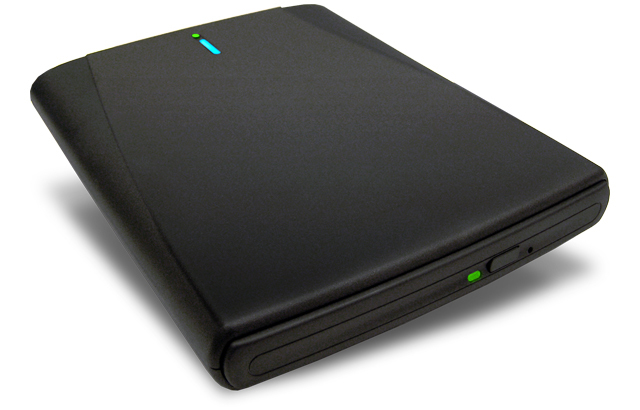 Fortunately for us, DIGISTOR has always been at the forefront of this progression and over the years, has sold tens of thousands of Blu-ray recordable drives into the market. We are excited to see what the next phase of Blu-ray technology has in store, and with so much experience and knowledge under our belt, we wanted to share with you the 5 coolest functions you can perform with your Blu-ray burner. 1. Archive all your digital assets for life! You may have tons of photos, videos and music that you’d like to keep forever. Some stored on hard drives, or backed up on cloud storage, and perhaps some just sitting on your computer desktop. Rather than risk the failure of the hard drive your files are on, or the reliability of your cloud storage provider, why not utilize Blu-ray disc and Archive software to consolidate all your precious memories and files into one central location? Yes, you can use Blu-ray to conveniently archive all your files safely and easily! When stored in dry cool conditions and depending on the quality your Blu-ray media, 50 years is a very realistic number for archival life. Compare that with the average 3 to 5 year life expectancy of a Hard Drive. 2. Archive and view your favorite movies and TV series on a single disc…. One of my favorite uses for my Blu-Recorder is to burn all my favorite TV show seasons onto a single disc. For example, I will rip and compress a full season of The Office to an .AVI or .MP4 file format and burn them to a 25 GB Blu-ray Disc. This helps me in a few ways. First, I now have an archive of my favorite show by season labeled and at my fingertips whenever I want it. Secondly, I can now duplicate a quick copy and share with any of my friends and family. Sure nowadays you can simply just stream these shows directly from the TV Network’s website but they are only available for a limited time and I like to have an archive of each season. Maybe you filmed and edited your own Blu-ray movie or you have a brand new release from Warner Brothers, by utilizing Blu-ray playback software for your PC you can watch high definition content directly on your computer! There are a lot of choices when it comes to PC playback software but I prefer Total Media Extreme from ArcSoft. 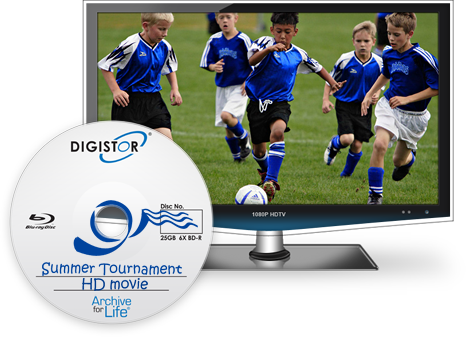 DIGISTOR actually bundles this software with our DIG-79102 external Blu-ray drive. This software is expensive to bundle into our package but we feel it’s worth it as the product simply delivers when it comes to the playback features. Officially there is NO support to play back Blu-ray movies on Apple computers but we did find and test it with software that claims it can do so. http://www.macblurayplayer.com/ Unfortunately, we saw mixed results and do not support the product at this time. If you try it I would love to hear the results so please post it on our Facebook page or comment below. I hear from friends and family all the time how “cheap” hard drive costs are nowadays. I can’t say I disagree but when you look at the long term costs of Blu-ray as a permanent storage platform it is very inexpensive. The fact is that you don’t have to transfer your data every few years from Blu-ray Disc™ as you do fragile hard drives, which makes the pricing even better. 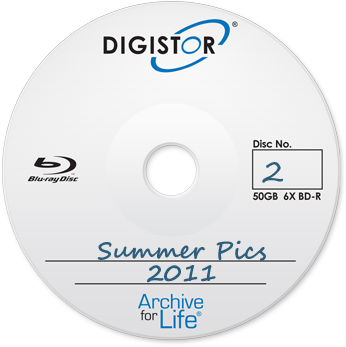 Let’s put aside the acquisition cost of the Blu-ray burner for now and just look at around a $4.00 price per 50GB disc. With that rational you can procure 500GB of storage for about $40.00! That is a tremendous value on a platform that keeps your data safe, secure, and portable. You buy a drive once and add storage as you need it, completely modular and scalable for long term storage of digital assets. Don’t give up on hard drives all together; they do have their place for everyday use and collaboration. However, for long term permanent storage Blu-ray is by far the best bang for your buck! The tools available to shoot, edit and distribute high definition video these days are truly AMAZING! I just returned from the NAB show in Las Vegas where I viewed many different types of capture devices, editing software and Blu-ray Authoring Software. Obviously, you can spend a lot of money on some of these products and some can be hard and tough to learn. However, there are some very easy to use products out there that allow you to create, edit and author all from the same program. These are programs that years ago were thousands of dollars that can now be procured for around $100. 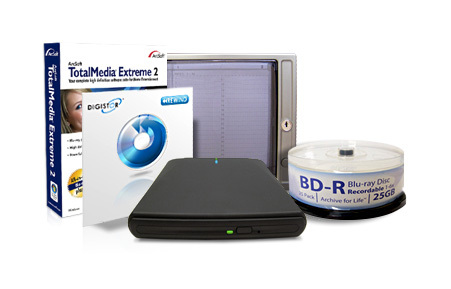 There are several on the market, we currently bundle ArcSoft TotalMediaExtreme 2 with all of our External Blu-ray Burners, a software suite that typically retails for $130 and is a great starter package. You should research the options and see what you are comfortable with before spending too much money.